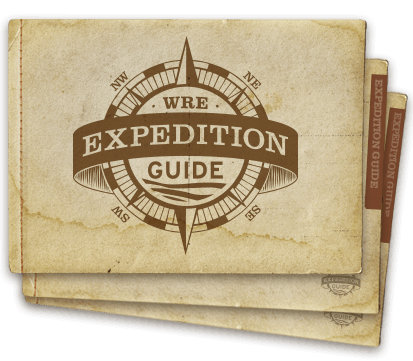 To help you preserve your memories of your Western River Expedition, we've created a special Shutterfly website where you can view photos from your trip, contribute photos to your shared trip album, download images, print pictures, create photo books and more. Accounts are free and should take less than a minute to create. 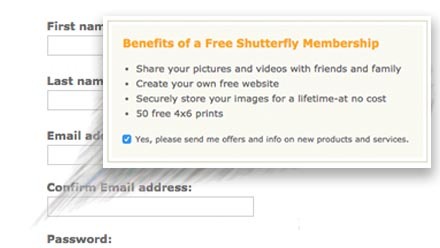 Sign up for your free Shutterfly account, or if you already have a Shutterfly account, use the login for your existing account. Find the login/sign-up in the upper right corner of our 2019 SHARE SITE, as shown. 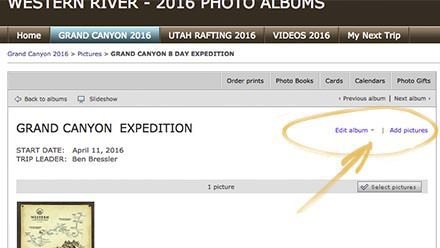 Find your album in either the GRAND CANYON 2019 or the UTAH RAFTING 2019 album pages. 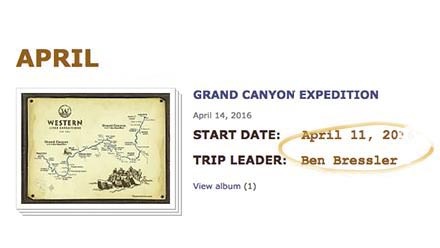 You'll see a list of albums sorted by month, trip title, trip start date, and finally by your trip leader's name. View Albums Archive for previous river seasons. Upload picturesto your album, by selecting the "add pictures" link on the right of the screen and choose the "upload" tab on the top of the window. Then browse to the pictures saved on your computer, select your best photos, and click "upload." If you've already uploaded trip photos to your Shutterfly account, simply find them in your account "Recent albums" folder in the Shutterfly window, select the images you want, and add them to your trip album. Please note that the images uploaded to Western's Shutterfly site can be downloaded by others and may be used for marketing purposes by Western River Expeditions. Questions?Consult the Shutterfly Support page with technical questions about working with digital photos on Shutterfly, or ordering and creating photo books. We can help you with non-technical questions about our photo sharing page, or locating your trip album. We're glad to help as we can!